The “gender of God” is a hot spiritual topic as attested by millions of hits on Google. I have to admit that question would have never struck me as interesting in the past. To me, it is a blessed assurance to know that God loves me as my kind heavenly father. But I started finding it fascinating that the Bible depicts the personality of God, metaphorically in the parental roles of a father and sometimes even as a mother. So, why did the “maternal” side of God go missing? 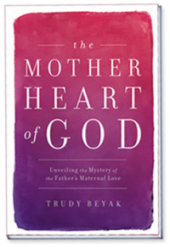 As I interviewed leaders of faith from Ruth Graham to the Vatican for my book The Mother Heart of God, I discovered surprising harmony across a wide spectrum of denominations.The Bible, in fact, reveals a peaceful resolution to the whole “gender of God” debate. That’s a wonderful thing to me and I really like how Nicky Cruz puts it. During our interview, he tells me that he does not know the answer to the question of the possible gender of God. The question is of no great concern to me, he said, compared to the importance of knowing and experiencing the power of God. And, he makes this key point: Just let the Holy Spirit’s power change your life.That’s what really counts! This entry was posted in Share a Blessing and tagged Gender of God, Holy Spirit, Nicky Cruz, Ruth Graham, Vatican on March 29, 2013 by Trudy Beyak.